So many of us are afflicted with negative, outdated programming that keeps us from reaching our full potential. In my many years as a psychologist, the two self-defeating inscriptions I’ve encountered the most are “I’m not good enough” and “I can’t succeed” (or “will fail”). And there are many other self-defeating beliefs that constrict us—born of the disparaging messages we may regularly have received from overly critical parents. Or parents who set standards for us that, given our stage of development, simply weren’t realistic. Unquestionably, when old, worrisome thoughts about your capabilities remain tightly lodged in your brain, your fondest hopes, dreams, desires, and aspirations will be compromised—at times, fatally undermined. For it’s extremely difficult to maintain sufficient motivation to apply yourself to goals, however much you may covet them, when, deep down, you harbor the (mostly unconscious) belief that success is forever beyond your grasp. Consider that continuing, despite various obstacles, to persist at something requires personal will and determination. And these invaluable assets can be mobilized only when you believe that putting in enough effort will virtually guarantee a positive outcome. Absent this conviction—that simply committing to, and persevering with, an undertaking will likely lead to success—you’ll probably stop well short of your goal. What else, after all, can you do when there’s a profoundly pessimistic (and self-sabotaging) voice inside your head that’s actively discouraging you from trying? Telling you that whatever you do, it won’t be good enough, ‘cause you’re not good enough? In such instances, with such self-doubt and anxiety gnawing away at you, your self-confidence and determination dissipate. And so your very ability to heed the healthier voice of your hopes and aspirations—or to proceed with a project you find compelling—may end up missing in action. The push-pull dynamic underlying such ambivalence invariably leads to hesitation and procrastination. It makes you apply the brakes with one foot even as the other is pressing on the accelerator. The inevitable result is stagnation, though one involving a tremendous amount of tension and distress. For your energies are divided. You’re at war with yourself, clearly your own worst enemy. Your anxiety-laden childhood programs—diligently and dutifully dis-confirming your capabilities—shut down your creativity, dis-enabling you from giving your all to anything you might wish to achieve. It cannot be overemphasized that, however misguided, these internal messages repeatedly warning you to back off are merely endeavoring to protect you. If as a child your various (though really age-appropriate) failures were shamingly pointed out to you—if, that is, you weren’t positively encouraged “to try and try again” till you learned how to succeed—that dispiriting voice inside your head is simply trying to shield you from the almost unbearable emotional pain you experienced when, so many years ago, you tackled something you weren’t yet prepared to handle and were then chastised or humiliated by harshly critical parents. Lacking in empathy and understanding for your struggles, they couldn’t help but force you to conclude that you just didn’t have what it takes to succeed. So, obviously, it’s the internal, not yet resolved, conflict within you that hinders your pursuing what could make you both happier and more self-accepting. And finally, these two states of mind may be pretty much the same. Actually, your failures in life—or your perceiving yourself as a failure—are assured so long as the child within you believes it would be foolish to try something new and risk failing. For, according to your inner child’s perspective, that would only exacerbate painful feelings of doubt and insecurity—and so make you feel even worse about yourself. Besides, the anxiety welling up inside you just in contemplating taking on some challenging project will subside as soon as you decide to postpone, or downright reject, it. But unfortunately (as every therapist learns in graduate school), whenever you “succeed” in quelling fear and anxiety through backing out of something, your self-esteem takes a hit. That is, such a retreat can only further weaken an already defective self-image. In brief, negative thoughts regrettably rising to the surface when you’re seriously thinking about “going for it” can seduce you into doing—well—nothing. That way such ancient, parent-induced beliefs—such as, “I don’t measure up,” “I’m incompetent,” “I’m inferior,” “I’m slow,” “I’m stupid,” or “I’m a loser”—can be pushed back down into your subconscious. But what needs to be scrutinized is the exorbitant costs of such self-protective rationalizing? of adopting the position that this just isn’t the right time to be taking on something difficult. True, such avoidance permits you to temporarily escape plaguing anxiety and self-doubt, but only at the expense of depriving yourself of an opportunity to succeed—and thereby begin to alter unwarranted, chronically negative assumptions about yourself. Frankly, there’s no simple, overnight fix for this dilemma. But whether you (1) start working with a therapist, who should be able to help you learn how to see yourself in a different light, (2) begin to explore articles and books on the subject of “re-scripting” your life and developing more self-trust, and -confidence, or (3) become more aware of your overly critical inner voice and start, regularly, to contest it, don’t expect that, on their own, your self-defeating programs will eventually disappear. What’s pivotal here is that you keep in mind that your chronic habit of putting yourself down wasn’t anything you were born with. Rather, it got “programmed” into you . . . and now it’s up to you—and you alone—to “reprogram” these life-constricting messages. Such a vital, self-reinvigorating process starts with the willingness to take total responsibility for your so-ingrained negativity. True, when you were a child you may have been victimized by your parents’ deficiencies in making you feel you were “good enough.” But now you’re a grown-up. So it’s only you who has the power to give yourself (and over and over till it finally locks in) the more accurate message of your basic competence. You need to continually remind yourself that you have sufficient intelligence to succeed at pretty much anything you diligently apply yourself to. And such self-empowerment doesn’t come from anything mystical outside yourself. It derives from what, realistically, repeatedly, and patiently, you tell yourself—until, through demonstrating an ever-strengthening ability to face the challenges you’ve been avoiding, your self-image begins to shift in ways that at last confirm your inherent capability. Ultimately, the key to such change is self-acceptance. That’s how you liberate yourself from the old, adverse, controlling messages unintentionally “bequeathed” to you by your family of origin. So you’ll need to become more aware of how in childhood your parents (and possibly siblings as well) interfered with your healthy, self-affirming development. And, much more than this, to recognize that the particular circumstances of your upbringing do not—and never did—portray who you are. Or what, potentially, you’re capable of, or could become. 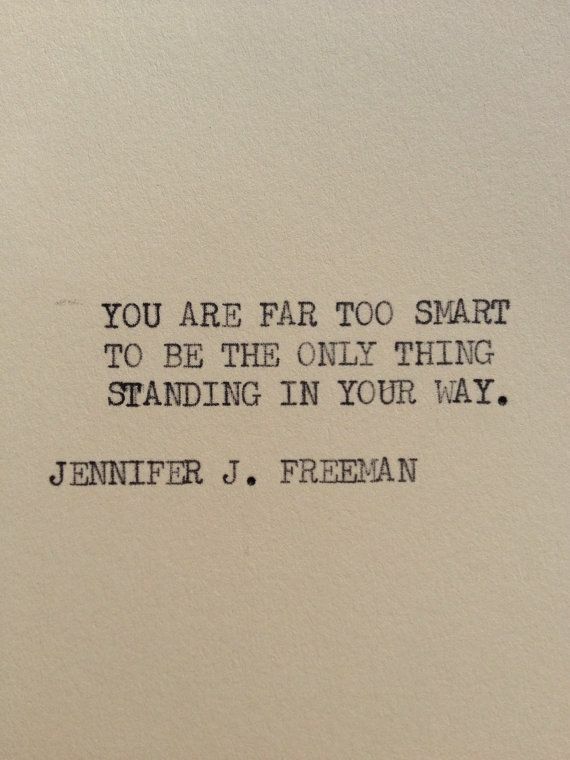 Because of your, till now, limiting assumptions about yourself, you may not have achieved what you’d hoped for. But that doesn’t say anything about your biological capabilities, about how you were “made.” So if you’re willing to work on yourself—though, granted, such work will be arduous and require both effort and dedication—you can “re-make” yourself. Your unfavorably distorted, archaic programming doesn’t have to burden you indefinitely. Not, that is, if you keep putting it to the test. Not if, despite whatever self-doubt and anxiety may yet linger from your past, you courageously prompt yourself to confront challenges that lie outside your comfort zone. Remember, the only way to extend your safe-enough-to-do-it zone is to keep pushing it outwards. And that will call upon all your creative energy and daring. But if you can learn to be kinder and more forgiving of yourself—and in ways your original caretakers could not—you can become the validating, soothing, and supportive parent you never had: One who’s full of understanding, empathy, and compassion, and—no matter what—will remain resolutely in your cheering section. That’s the essence of unqualified self-acceptance. And it’s just what you’ll need to embark on what could be the most exciting adventure of your life. For, after all, such a quest involves nothing less than pursuing a life that’s vibrant, exciting, and intimate: all the elements that make life rich and fulfilling.